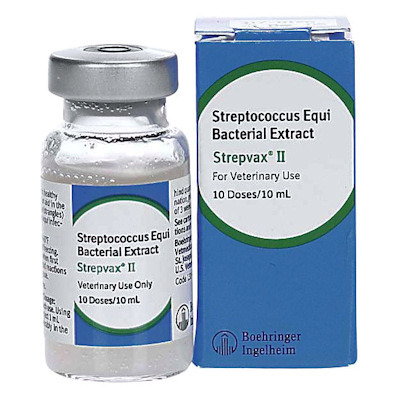 Strepvax II (Boehringer-Ingelheim) 10 dose Injectable Strangles Vaccine. Protects against strangles caused by Strep equi. Made with concentrated M-protein extract to provide superior protection with a minimum amount of side effects. Recommended Dosage is two 1 ml doses given at 3 week intervals initially, with an annual booster thereafter. Foals less than 3 months should receive an additional dose at 6 months or at time of weaning.